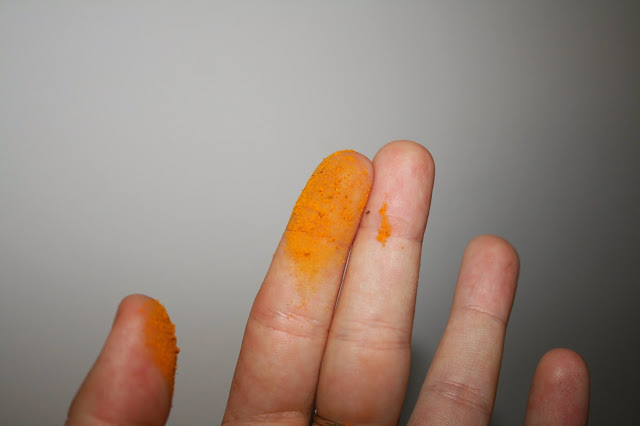 In my first real post I am presenting you….pampampaaaam Turmeric! Turmeric is, as one would say, an essential spice in my kitchen, and why it should become your must have spice, I’ll explain in the text that follows. As you may have noticed, turmeric is a spice that has really strong yellow color, almost orange. 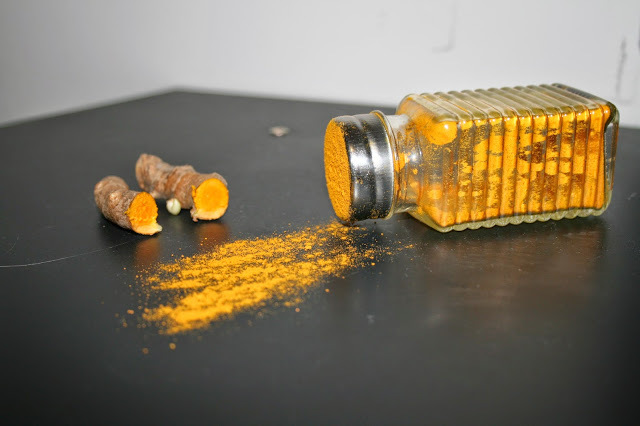 Turmeric is a spice spice that comes from the root of the plant Curcuma longa. It has dark brown peel and dark orange meat. It comes from the ginger family (about which I’ll write in my next post), so the fresh turmeric has spicy, slightlyresinous and bitter taste. But when it’s dried and grounded, especially after being cooked, it has a much subtle note. The thing that is the essential part of turmeric is curcumin- natural yellow colorant and it is marked with E100 in food (I hate those Es, they’re usually bad stuff). Turmeric is also the main ingrediant of curry spice mixture and it provides the recognizable yellow color. If you’re not buying spices in specialized stores (which makes me sad), but in regular grocery stores, pay attention to the color, because it should be as yellow as possible, almost orange. If it’s light yellow it means it means it already oxidized or is mixed with starch, soy etc. You should keep it in dark box/bottle because curcumin loses its value when it’s exposed to direct light. And now the fun part: health benefits! Turmeric is an extremly healthy plant and therefore is used for many issues: inflammatory processes, swealing, stomach, menstrual problems, cancer, liver disease, atherosclerosis, osteoarthritis, bacterial infections etc. For us, ladies, this menstrual problem part is very important: taking turmeric’s extract two times a day for two weeks before menstruation (from the beginning of ovulation till the first day of your period) can significatnly reduce spasms, which is very importan because I for one always bend like a worm and suffer. As for swealing and joints/knuckles, the process is thus: if you have any swealing on your body, put a wrap soaked in warm water with lots of turmeric over it. Why, you may ask? Because curcumin has strong antioxidant, antibacterial and anti-inflammatory benefits. If you have issues with your joints, clenched fingers, rheumatism indications, atherosclerosis etc., you should drink 1 tea spoon of turmeric in 1 dcl of water twice a day, in the morning and in the evening. It helped me with my left shoulder joint and there’ s areason for it: turmeric has high percentage of calcium, iron and magnesium which are important for good ossification of joints and reducing the friction between the bones. Also, turmeric has a benefitial effect on digestion. Apart from mierals and vitamins, turmeric contains almost 21g of fiber (in 100g). It reduces flatulence, stomach acid, but it also cleans the liver. 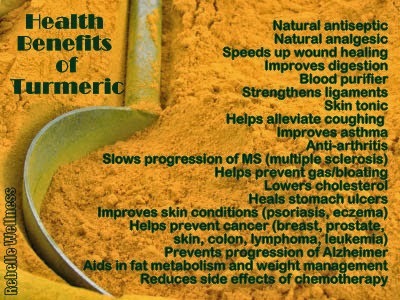 You can drink the extract or do the following: eat turmeric with every meal. From breakfest to dinner, put turmeric in every meal you eat beacuse it will increase the intake of important minerals, vitamins and fibers and reduce pain, spasms, flatulence etc. I can’t seem to stress it enough: in every meal, sweet or salty. Turmeric doesn’t have strong smell or taste, so it goes well with almost every food. Why should you use so much and for longer periods? Because spices are in general herbs and have benefitial effect on the organism, but they are not concentrates and they don’t act agresivly like medicines. That’s why you should use them more and longer for good results. If you think medicines work over night, you are mistaken, because they actually just reduce or cover the symphtoms of a diseasem while the inflammatory process still takes place in your body. Ostensibly you are being cured, but only your symphtoms are reduced. So if you get sick soon, it means that the inflammation never stopped. You should ask yourselves: how healthy is it to get cured over night? Your organism didn’t get sick in one day, so it can’t (and shouldn’t) get well over night (same goes for gaining and losing weight). Mankind has been successfully treating various diseases with herbs and spices for years and we shouldn’t lose that craft.